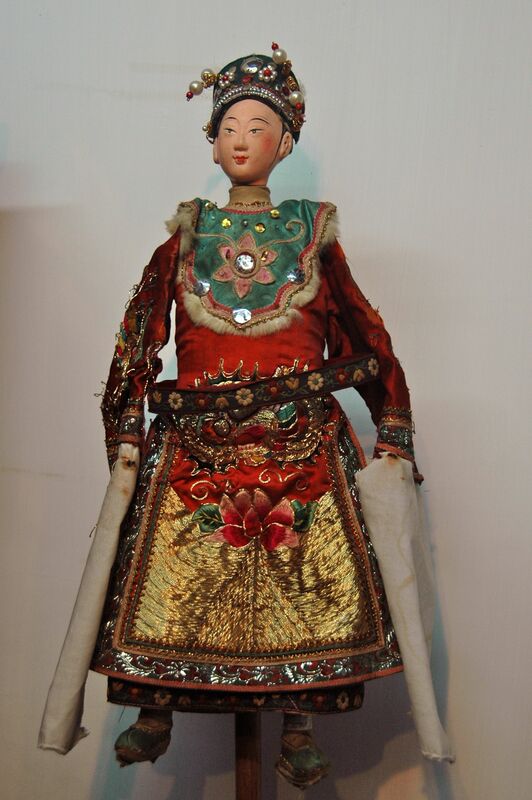 There are many different types of puppet in China, this is a Chaozhou wire puppet. It is called a wire puppet because it is controlled by 3 metal wire, one supports the head and the other two control the arms. Its other name “paper shadow puppet” reveals its history; at the Song dynasty the flat shadow puppet was introduced in the chaozhou region, it was later developed into 3D, as the demand from the spectators grow the paper between the puppet and the spectator is removed and the feature of the puppet refined (head, hands and feet, elaborated costumes). The head is made with clay, paper as hands, dried grass as body and wooden carved legs but the wire control remains.